The inverted comments in the post heading should hint that all is not well with us since receiving these. It will be apparent why they have been inserted when you read our response to TfL. We urge everyone to respond personally to the consultation, say exactly what you think. It’s important that as many people as possible respond. “Lewisham Cyclists met to discuss the plans you sent to us. extra space has not been used to best advantage. even more dangerous than it is now. a cyclist at this particular point of the junction. junction design that benefit all road users without excessive delay to motor traffic. reason, narrowing sharply as it does in both directions on the A2. protected crossings on all four arms of the junction. junctions in South London e.g. Oval/Kennington. Only 4 traffic light phases needed for this. They are numbered on the diagram as traffic flows 1, 2, 3, 4. Same number goes at same time. Cyclists use 2-phase right turns on all 4 arms. Consideration could be given to banning right turns out of secondaries ? 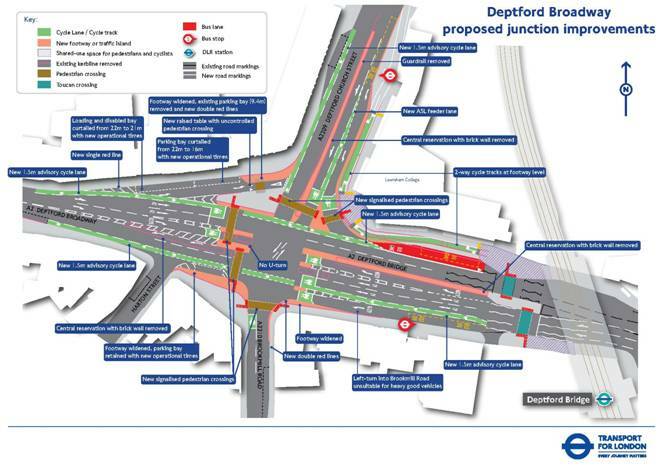 In addition, Deptford Bridge may well need bus stop bypasses and the bus stop on the south side of Deptford Broadway may need relocating to the west of the junction to make this possible. The section of off road cycle path past the very busy entrance to Lewisham College to access NCN 21 (Waterlink Way) may not be needed as cyclists proceeding this way could use the cycle lane crossing in phase 3 of the lights and then a segregated or shared use lane on the South side of Deptford Broadway to rejoin the Waterlink Way by Deptford Bridge DLR station. 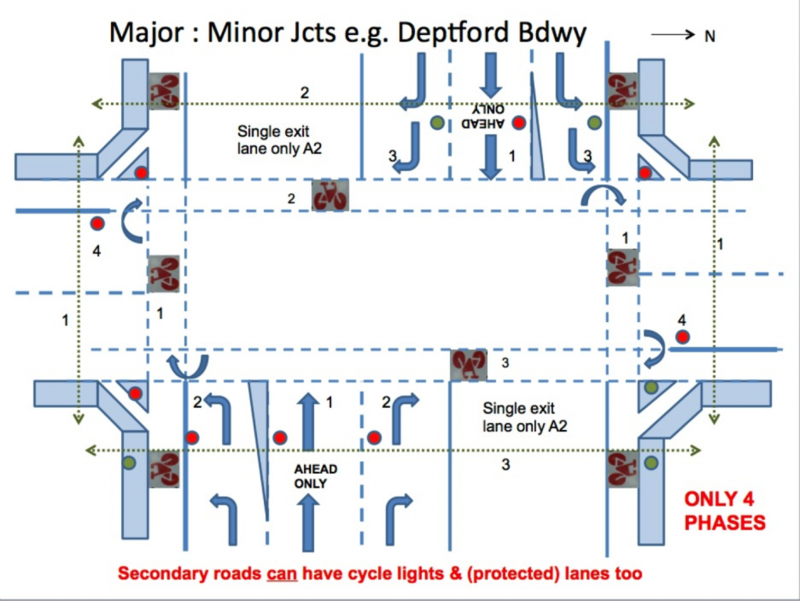 Particularly like the Lewisham cyclists scheme for Dept. Broadway. It reduces the number traffic light phases required, speeding up the main A2 traffic. The 3 filter lanes on Brockmill and Church street will make a difference, these roads easily get blocked by traffic turning right and queuing back into these adjoining roads. It adds sensible pedestrian crossing lights, much needed as I see near misses of pedestrians every week and it is only a matter of time before we have a fatality. 2 stage turns are not really safe and convenient; please consider instead simultaneous green phases, i.e. cyclists can cross the junction all in one go. Please see http://www.aviewfromthecyclepath.com/search?q=simultaneous+green for more information and also watch David Hembrow’s videos on YouTube. Other than that, trying to humanize the junction and make it easier to use, especially for vulnerable road users, is fantastic. The two stage right turn is a compromise, we know. TfL will not accept simultaneous greens because this requires an extra phase in the lights which won’t pass their modelling systems. Now, modelling is a whole separate issue again, which we could challenge, but that’s a separate battle which is being fought on a different battlefield, so to speak. Simultaneous greens with separate crossing tracks for pedestrians and cyclists is possible here…definitely the space for it. In fact there aren’t many junctions in London with as much space. One of the reasons why we were so angry with the mere tinkering offered by TfL ‘s recent plans that actually made it worse for cyclists. However, at the moment, it’s a step too far for TfL…although, even our compromise proved a step too far for them. According to Hembrow, in the Netherlands all that’s needed is one or two 20 second phases of SG per cycle, and separating cyclists and motorists in time and space would reduce delays, especially when subjectively safe junctions encourage modal shift from motoring to cycling. We need to seek out the radicals in TfL; you have stated that some engineers want to transform the junction but other planners are more conservative.